It had to happen eventually, didn’t it? 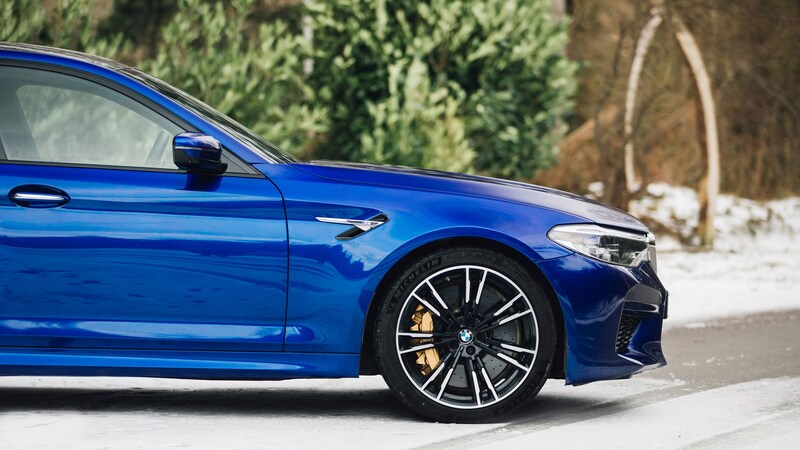 Since the first BMW M5 in 1984, the ultimate 5-series has always been resolutely rear-wheel-drive, but as the super-saloon power war eases past 600bhp, the new, sixth-generation 2018 BMW M5 has gone all-wheel-drive on us. You can only defy physics for so long, after all. The 2018 M5’s most natural rival, AMG’s 603bhp E63, also now drives all four wheels as standard. BMW says the G30 M5 is more a 2WD+2 than a 4WD car – it’s still very much rear-biased, but in theory should be less scary in the rain or on frosty winter mornings. And the 2018 M5 even has the option to switch to a fully rear-drive mode. Does that make it the best of both worlds? Let’s find out in our detailed new 2018 BMW M5 review. Based on the latest G30 generation 5-series, the new 2018 M5 is lighter than the car it replaces, thanks to plenty of aluminium in its construction, and some composite components. At 1855kg the new M5 still a pretty weighty beast, though, albeit a smidge lighter than the AMG E63. The roof is made of carbonfibre-reinforced plastic (CFRP), with the dual benefit of lowering the centre of gravity and increasing torsional rigidity, along with the less prosaic bonus of looking kinda racy when specced in a lacquered bare weave finish. There’s an entirely different front apron compared with the regular 5-series, with giant apertures to gulp in as much fresh air as possible for the engine, charge cooling, transmission and brakes. Despite all that fresh air in its face, the new BMW M5 is really quite a subtle, understated car, and from a distance you could mistake it for a 540i M Sport. You’ll probably find yourself in one of two camps – a fan of its under-the-radar, sleeper disguise, or wishing it was a bit more wild-looking – I find myself torn between the two. It’s quite a lot of cash, this car – nearly £90k, before options – but it’s also a lot of car, both in terms of dimensions and performance. The all-wheel drive helps the new M5 crack 0-62mph in 3.4sec, and 0-124mph in 11.1sec, making it the fastest-accelerating iteration yet. Whip the 155mph top speed limiter off as part of the optional M Driver’s package and it can hit 190mph. What engine does the new 2018 M5 have? It’s a development of the previous car’s twin-turbo 4.4-litre V8, using the most powerful version used in the 30 Jahre edition as its starting point. Max power is 592bhp (or a nice round 600 metric horsepower), and max torque is a frankly brutal 553lb ft from 1800rpm. 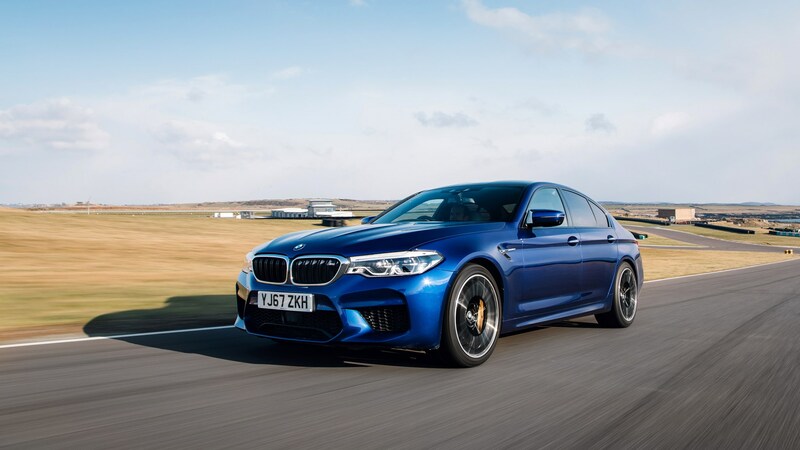 While the previous car used a dual-clutch transmission (DCT) the new M5 has an eight-speed ‘M Steptronic’ conventional torque converter auto gearbox, with manual shifts possible with the wheel-mounted shift paddles or by push-pulling the selector lever, touring car-style. The new eight-speed auto is said to be a better fit with the all-wheel-drive system, while offering similar shift times to the DCT ’box. It’s also smoother at going into reverse – some previous-gen M5 owners have complained of a less-than-smooth engagement of reverse gear with the DCT. Having eight speeds rather than seven is also better for fuel economy. Provisional combined figure is 26.9mpg, so the M5 is still pretty thirsty. How does the new M5’s all-wheel drive system work? 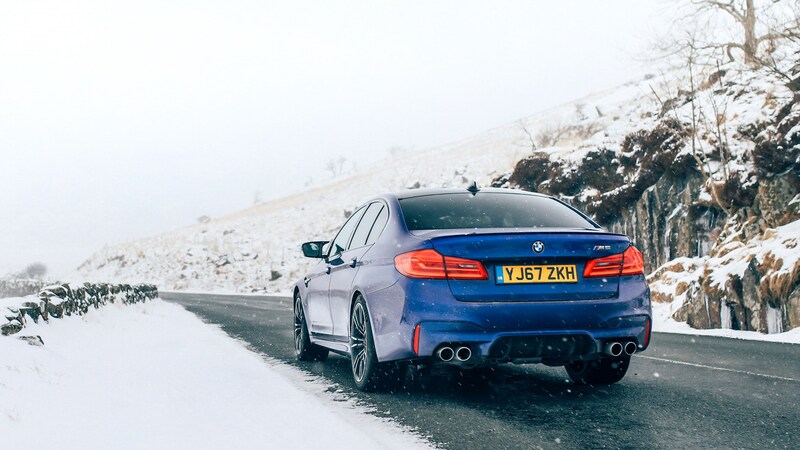 Branded ‘xDrive,’ BMW’s name for its AWD systems across the board, the M5’s set-up is made possible by a single ECU that controls both differentials along with the stability control, ABS and various other vehicle dynamics systems. The central computer is extremely quick at processing information – this type of system wouldn’t have been possible a few years ago. A transfer case constantly controls the torque split front to rear, and an electronic Active M differential splits drive between the rear wheels. It’s possible to put the car into a purely rear-wheel-drive mode, too. The Mercedes-AMG E63 has something similar, billed as ‘Drift Mode.’ Even in four-wheel-drive mode, it’s predominantly rear-biased and it’s probably best to think of the M5 more as a rear-drive car with on-demand front axle help when required. In gentle driving, it’s in 2WD mode most of the time to save fuel, bringing the front wheels into play when required. It does so commendably imperceptibly. Peter Schmidt, one of the lead engineers for vehicle dynamics at M, says the first prototype 4WD M5 was built four to five years ago, based on the previous-gen car. The latest M5 was around three years in development from start to launch. How does the new BMW M5 drive on the road? The 2018 BMW M5 really is a lot of fun. The engine has a bassy baritone growl – it doesn’t sound like a woofly muscle car V8 as per the AMG E63, but it’s an engagingly snarly sound nonetheless. The auto gearbox works fine, swapping gears smoothly, swiftly and unobtrusively. It’s only when you’re really going for it on the track that you feel – rightly or wrongly – that it doesn’t quite have the same finger-click response as the DCT. But it’s certainly smoother, and doesn’t punch you in the back in the same way when you’ve selected the fastest gearchange map. A high point is the steering. The electric power assistance is nicely judged, full of feel and with a nice linear, faithful response, regardless of which of the three selectable steering weights you’ve selected. And the weightiest Sport Plus setting isn’t as needlessly heavy or sharp as some performance cars. Incidentally, if you’ve ever wondered why some cars have such heavy settings, M vehicle dynamics engineer Peter Schmidt says it’s because some drivers prefer to brace their upper body on the wheel, rather than using their knees to stabilise themselves against the transmission tunnel or doors when driving quickly. Who knew? With the active dampers in their softest Comfort setting, ride quality felt reasonably pliant on the lumpiest bits of road in western Portugal where we tested the car. It feels like it will translate well enough to UK roads, but you probably won’t spend much time in the firmer Sport and Sport Plus settings – the latter is best suited to the track. On the Estoril circuit, in six quick-ish laps behind a pace car, it felt very adjustable on- and off-throttle, with predictable, reassuring handling but plenty of potential to go very sideways if that’s your thing, even in 4WD mode. You’re always aware of the car’s bulk but it controls its mass well. Carbon ceramic brakes are an option. There’s probably little to be gained on the road, but on the track they work well. How baffling are the driving modes in the new BMW M5? Here goes... Default setting is in 4WD mode, with the traction control and stability control systems on full-alert. 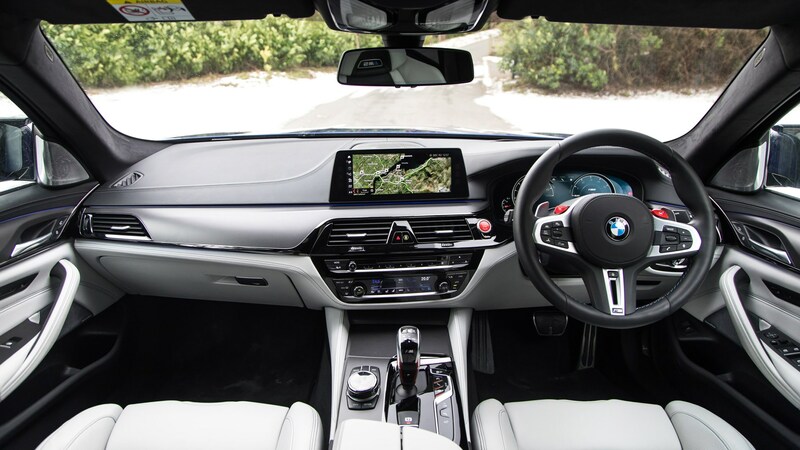 One press of the stability control button next to the gearlever and you’ll activate M Dynamic Mode (MDM) – which relaxes the stability control a touch and adopts an even more rear-biased torque delivery than normal. It’s accompanied by a little animation of an M5 shimmying its tail on the display screen. It’s still very safe in this mode, and the system will quickly intervene if the surface is slippery, while allowing the car to adapt a reasonable degree of tail-out attitude, whether by power oversteer or weight transfer. Hold the button down for a few seconds, and the stability control system is switched out, activating another sub-menu, giving you three choices: 4WD, 4WD Sport (which directs the lion’s share of torque to the rear axle) and 2WD. The latter is the one to choose if you want to do burn-outs or lairy powerslides on the track – but be aware, you really are on your own, in a car with 550+lb ft of torque. Probably best not to do this if it’s raining. If that wasn’t enough pick’n’mixing’n’matching, as per most modern M cars there are also three independently adjustable modes for the power steering, engine/throttle map, dampers and gearshift speeds (from light to heavy, economical to responsive, cushiony to firm, gentle to ferocious – you get the idea). 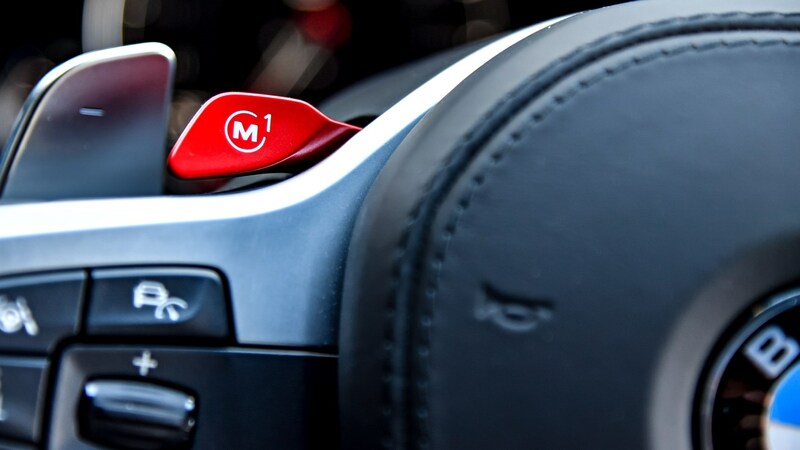 There are two easily accessible shortcut memory buttons on the steering wheel, labelled M1 and M2, which you can use to store your favourite pre-sets for all the various modes. I tried it on the dry, but dusty, coastal roads south of Lisbon, and it’s certainly frisky – but the chassis is communicative and trustworthy, as long as you’re careful. In 4WD mode the M5 is still very rear-biased. On the road, in 4WD Sport mode with DSC switched off it still feels safe, in the dry at least, and allows quite a lot of adjustability. This is the mode in which it would be fastest on track, too. Overall, the new BMW M5 is a car with well-balanced, communicative handling that’s a lot of fun to drive. When I was at school I used to swap my old 4WD Tamiya r/c car to RWD mode by taking the front driveshafts out – now M5 owners can do it by a pressing a few buttons. It’s good fun to experiment with, and another string to its bow. 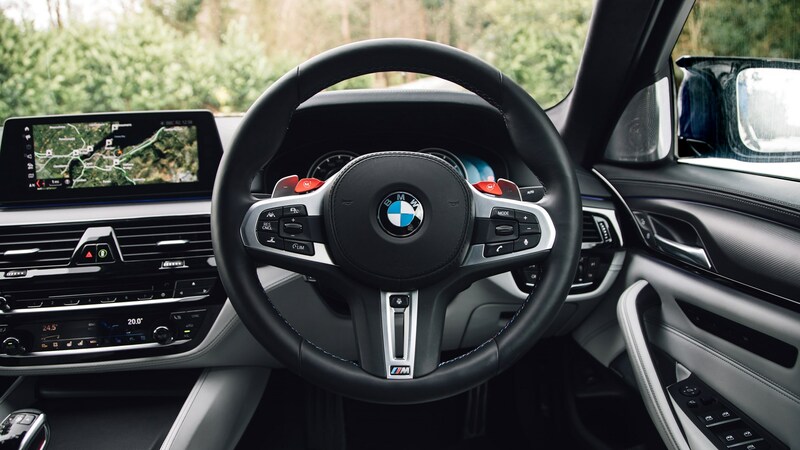 What’s the new BMW M5 interior like? Very luxurious. Interior materials and quality are hard to criticise, and like the exterior it avoids being too gauche. The front seats are lovely, like you’ve been caught in a baseball mitt. They’re heated as standard, cooled as an option, and can even be specced with a massage function. Only slight complaint is that the seat base lifts in a straight vertical plain; I’d like a bit more tiltability (for want of a better word), to angle the seat base up slightly. There’s plenty of space inside, with plenty of elbow and knee room, and a huge boot. This is a very big car, though – the G30 5-series isn’t small. What else do I need to know about the new BMW M5? Standard tyres are Pirelli P Zeroes, 275/35 and 285/35, on 20in double-spoke alloys. You can balance the demure styling with some outlandish matt paint finishes if you choose, particularly the dark red shade used on the first 400 launch edition cars – all of which are sold out, however. Adaptive LED headlights are standard, the optional M Sport exhaust is worth having, the ceramic brakes probably aren’t unless you plan on the occasional trackday, the optional active cruise control can stop the car and pull away autonomously, and you can spec a tow bar if you like. Apple CarPlay preparation isn’t standard, which seems a bit stingy on a near-£90k car. BMW UK expects to sell circa 950 M5s in its first full year of sale. It sold 466 of the outgoing one in 2016. Will there be a BMW M5 estate this time round? ‘There is a lot of talk about it, but it’s still at the “maybe/what if” stage,’ dynamics engineer Peter Schmidt told me. That’s because the rear axle and wheel travel is quite different on the 5-series wagon, and thus it would need a lot of (probably expensive) redevelopment.